MIX YOUR OWN E-LIQUID There are 57 products. Aroma L & ULTIMATE IFRIT 30 ml If you mix a donut with the best apple Ifrit leaves us, Content: 30ml. Aroma L & ULTIMATE LEVIATHAN V2 30 ml A sweet strawberries of incredible realism meets the power of continuous freshness that is the essence of the range Ultimate from A & L. Content: 30ml. 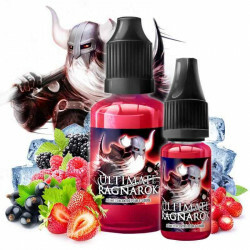 Aroma L & ULTIMATE VALKYRIE 30 ml A handful of red fruits and their freshness. Content: 30ml.